Info "More beasts! More loot! More yes!" 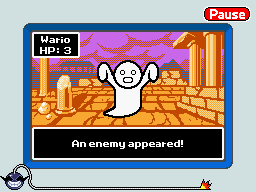 WarioQuest 2 is one of The Job Center microgames in WarioWare: D.I.Y. This game is a sequel to WarioQuest. The player has to do the same thing as the first game. Like in its original game, the player has to hit the monster three times to kill him and win the game. But, this time, the monster attacks the player and they lose one of their three HP. However, the time limit doesn't allow the monster to attack three times. If the player cannot defeat the monster in the time limit, the game is lost. "The world-famous RPG got a sequel! All it needs now is a nasty monster that's bigger and badder than your last one!" This page was last edited on July 19, 2018, at 22:37.